Finally, Pinball FX3 joins the Surround Sound Feedback Club... thanks to the combined power of DOFLinx and PinUp Player. FX3 only plays all of its sounds through your front speakers. This means that all the mechanical sounds for flippers, bumpers, slings, etc will always be heard from your Backbox speakers. With these PuP-Packs, you will now get mechanical pinball sounds playing from your surround sound channels (not your front speakers). This means anyone with a cabinet and a SSF setup will get the most benefit of cool 3D positional audio and feedback. Everyone else who has any kind of surround sound setup (cabinet or desktop) will also benefit from the surround sound effects! Please Read the Description and all of the Install Instructions! Also watch my video below that explains the install setup and how everyone can help update the PuP-Packs for a more complete SSF experience on all tables! NOTE: Pinup Player SSF will only work with your DEFAULT Sound Card, for those who have more than one in your system. You MUST have DOF R3++ installed! This is a requirement for the newer version of DOFLinx to function! Install it using mjr's excellent Installer that does everything for you. This is the most up to date version of DOF available. NOTE: if you only have SSF on your cabinet and no other hardware, then you will need a copy of directoutputconfig.ini for DOFLinx to use. This is normally generated by DOF Config Tool, but if you don't have any cabinet hardware for DOF then you can't generate that file. I have included my own example file for you to use if you need it. Simply copy the "config" folder from the "directoutputconfig (for SSF only users).zip" file to your DirectOutput folder. 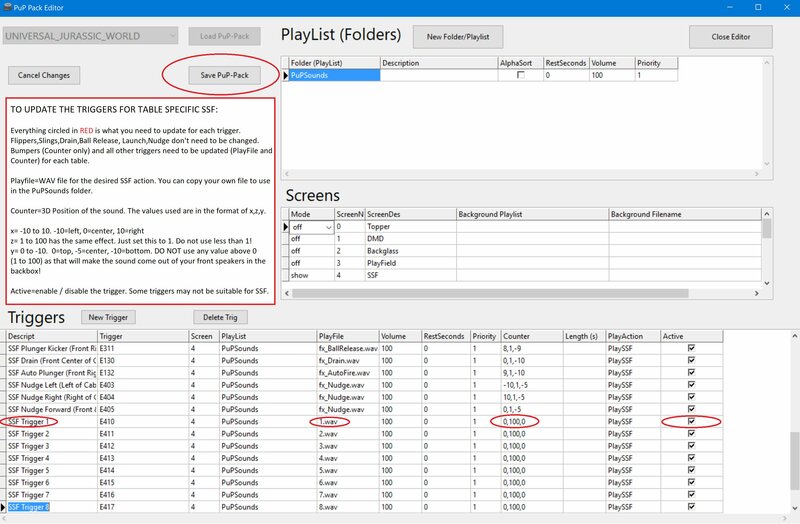 DOFLinx is what triggers any kind of feedback, lighting, or PinUP Player SSF functions for FX3. Once it's setup and configured for FX3, you will configure your DOFLinx "PATH_FX3" in the DOFLinx.ini to point to the "FX3_PUPlayer" folder instead of the "FX3" folder. The "FX3_PUPlayer" folder contains updated versions of the *.FX3 config files. These have been updated by me to include the PinUP Player triggers needed for the FX3 SSF PuP-Packs. You need Pinup System installed which includes PinUP Player. This is required for the FX3 SSF PuP-Packs. This 1st collection of PuP-Packs (DEFAULT TRIGGERS) will allow ALL Pinball FX3 tables to have SSF for the BASIC Pinball functions. This includes Flippers, Slings, Bumpers, Drain, Ball In, Launch, Nudge Left, Nudge Right, and Nudge Up. Each table will use the same sounds and same 3D positions for the effects. This Pack is required for ALL tables. These will be what you use of you are happy with not changing or adding anything more to the default setup for each table. The 2nd collection of PuP-Packs (ALL TRIGGERS) include both the Default SSF Triggers and Sounds, but also includes all the extra TABLE SPECIFIC Triggers. These include all the additional DOFLinx triggers for each table such as Drop Targets, Ramps, Orbits, Kickers, VUKS, etc. These extra triggers are already added to each tables's PuP-Pack, but they are not updated for their sound file, description, or 3D position! This is where the community will need to help out (by updating these PuP-Packs), as there are currently over 60 tables to update! Only use the ALL TRIGGERS PuP-Packs if you intend on updating any of them. Only copy and edit one PuP-Pack at a time. The extra triggers are setup to use "numbered sounds" (1.wav,2.wav,3.wav,etc) so that you can "hear" where the trigger on the table is coming from while playing the table. Simply copy over the PuP-Pack... play the game...listen for the numbers while playing and note where on the table you heard it. Then simply edit the PuP-Pack for the table (using the PuP-Pack Editor), and update the Trigger (that uses the numbered .WAV file you heard). You will need to update the sound file needed for what kind of action it is (ramp, drop target, ball rolling,etc), the description, and the 3D position. If you find that any of the triggers aren't ideal for SSF feedback (they are only used for flashers,etc), then simply disable them in the PuP-Pack Editor. You can also update the Default Bumpers 3D position as well since each table will have them in a different location. Save your updated PuP-Pack. Once you have COMPLETED the PuP-Pack, you can upload the "triggers.pup" file (or the entire PuP-Pack if you have new sound files required) to this thread for others to use. I will then add them to a COMPLETED FX3 SSF PuP-Packs Collection! The COMPLETED FX3 SSF PUP-PACKS.zip is a collection of the currently completed FX3 SSF PuP-Packs. These include the extra "Table Specific" triggers that have been updated to include 3D position and Sound Files. Simply copy these PuP-Packs to your PuPVideos folder! No updating is required for complete SSF available for those tables. Once you have everything installed and setup, simply run DOFLinx as Admin, and have it running in the background. Then when FX3 loads a table, shortly after its loaded, DOFLinx will load the table's PuP-Pack. Enjoy FX3 Surround Sound Feedback! Remember...the more the Community helps out with updating each table's PuP-Pack, the better the SSF experience will be for everyone! Please read the REQUIREMENTS in the DESCRIPTION Tab! You must have DOF R3++, DOFLinx 6.30 or higher, and Pinup System installed and Ready to go first! DOFLinx 6.30 or higher now includes a new set of updated *.FX3 files that have been updated by me to include the required PUP EVENT Trigger commands. These are all located in the "FX3_PUPlayer" folder. You need to edit your DOFLinx.ini "PATH_FX3" to point to this folder. You need to turn OFF the "PHYSICS" sounds in the Pinball FX3 Sounds settings, as these sounds are what we are replacing with the SSF 3D positioned Sounds. Also, you will probably want to lower all the other Sound Settings such as Music, Voiceover, Effects, etc so that your SSF sounds will be more noticeable. Unzip the "FX3_SSF PuP-Packs (Default Triggers).zip" to your "PinupSystem PuPVideos" folder. This will give you the BASIC SSF for ALL FX3 Tables using the same sounds and 3D positions for every table. (Flippers, Slings, Bumpers, Drain, Ball In, Launch, Nudge). These PuP-Packs have all the BASIC SSF, but also include all the additional DOFLinx triggers unique for each table such as Drop Targets, Ramps, Orbits, Kickers, VUKS, etc. HOWEVER, these Packs MUST be updated and COMPLETED by the Community for Sound Files and 3D Positions specific to the action. Only use the FX3_SSF PUP-PACKS (ALL Triggers) if you intend on updating any of them. Only copy and edit one PuP-Pack at a time. Unzip the "FX3_SSF PuP-Packs (ALL Triggers).zip" to a Temporary Location. Copy the PuP-Pack you intend on updating to your "PinupSystem PuPVideos" folder. Then Edit and Complete it using the PuP-Pack Editor. If you have COMPLETED any of the PuP-Packs, then upload the "triggers.pup" file (or the entire PuP-Pack if you have new sound files required) to this thread for others to use. I will then add them to a COMPLETED FX3 SSF PuP-Packs Collection! The COMPLETED FX3 SSF PUP-PACKS.zip is a collection of the currently completed FX3 SSF PuP-Packs. These include the extra "Table Specific" triggers that have been updated to include 3D position and Sound Files. Simply copy these PuP-Packs to your PuPVideos folder. No updating is required for complete SSF available for those tables. This topic contains 56 replies, has 11 voices, and was last updated by Kernel 3 weeks, 5 days ago. NOTE: PinUP Player can only use your DEFAULT Soundcard for SSF. -change your DOFLinx.ini file to have “PATH_FX3” point to the “FX3_PUPlayer” folder (that has my updated *.FX3 files that include PuP Events). For anyone who wants to update any of the ALL TRIGGERS PuP-Packs for table-specific SSF extras…. In the above video, goto around 12:46 to learn more about how to edit the ALL TRIGGERS PuP-Packs. Copy over the ALL TRIGGERS PuP-Pack you want to edit…play the table…listen for the “numbers” and note where they came from while you play. Then edit the PuP-Pack and make the changes noted on this picture. Everything is explained in the picture. Terry, is there a configuration step where you tell pup which soundcard to use for ssf? dflinx is up, I get dof feedback, b2s is up, but no ssf sounds. your original aliens pup pack still works well. Nothing along those lines no. PuP will only use your DEFAULT soundcard for SSF or anything else audio related. Any FX3 SSF PuP-Packs that have been updated for the table specific extra triggers and SSF effects (instead of the basics only) will be included in the “COMPLETED FX3 SSF PUP-PACK.zip”. The first completed FX3 SSF Pack is ALIENS! I have attached my first try for a complete SSF pack for Jurassic World. Give it a try! I also attached a png-file I used to better determine the position of the sounds. Just take a screenshot of the table, adjust the width/height of the screenshot to get the same size as the template and put the screenshot under the template in your image application, for example Photoshop. Awesome stuff and thanks…. I believe though that -5 would be the center for Y, and you have it at -4…. but great job! Only had time for a quick test (daughter’s birthday), but great job, and love the use of wire rap sounds and the ball drop sounds, ball roller,etc.. The only thing that was missing was updating the Bumper’s 3D position, but other than that…great job! I’ll add it to the collection when i’m home later unless you want to update the bumpers? Damn! I’m gonna redo the template so that it looks correct. I’m gonna correct the bumper sounds also so I’ll get back soon with a new upload! Excellent…when I’m home later I’ll check it out. Nice new template image example! Attached is a complete pack for Family Guy! I’ll be adding everything you update to the complete pack sooner or later as they come. I’m currently in the middle of a bunch of stuff…and DDH69 also updated the Aliens *.FX3 file so more feedback for Aliens coming…and maybe more SSF for that table too! DOFLinx 6.31 released! FX3 now works again with the latest update as does FX3 PuP SSF! I’d recommend trying to block updates or write-protecting your “Pinball FX3” folder located in “Steam\steamapps\common” (included all files, folders, and sub folders). At least until you know DOFLinx has also been updated to work the next FX3 update,etc.. This DOFLinx update also fixes some Future Pinball (and possibly other) issues that seemed to be affected with the more recent Win 10 updates.